Buddhism & Hiking | the best is yet to come. My friends and I truly live for the weekends here in Hong Kong. Each weekend we pack in as many things to see and do as we possibly can. We try to make the most of the time we have outside of the 40hour workweek. This weekend was no exception. Besides the sweltering heat this past weekend was incredible! It was one of my favorite weekends so far in Hong Kong. Friday, after a rough day of work I went out to have fun dancing with a few friends. Saturday morning and afternoon I went to a fishing village, the Po Lin Monastery and saw the Big Buddha (The outing was put together by our program, Dream Careers). At night I went and saw the movie Monsters University in 3D with friends. 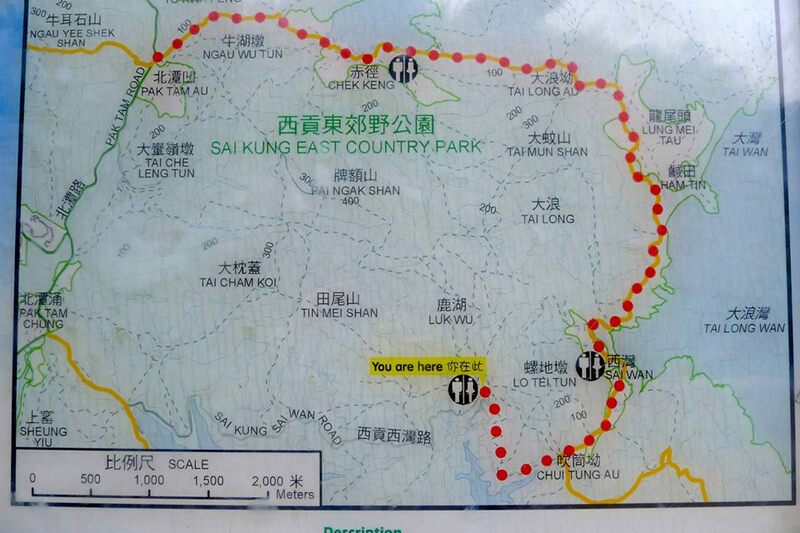 Sunday, I trekked 12km (7.4miles) on the Tai Long Wan Trail! I had been looking forward to July 13th since I first realized we were going to the Po Lin Monastery and seeing Big Buddha on that day. Wherever I travel I always make a point of visiting religious buildings. Usually, I visit cathedrals and churches but in Asia there are mostly temples and monasteries, which I find equally as beautiful! Before we went to the Monastery and saw Big Buddha we went to the Tai O fishing village. Tai O is located in the western coast of Lantau Island. It is a quaint and picturesque village, with traditional stilt houses predominant of the old southern Chinese fishing villages. 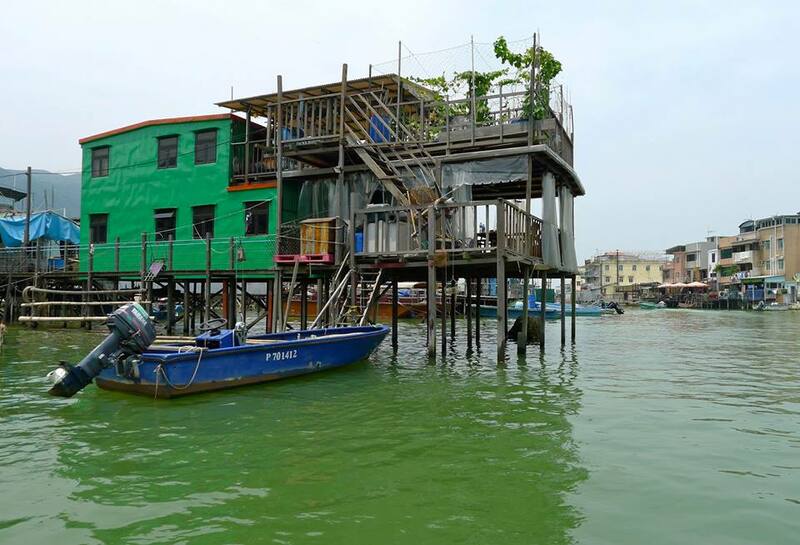 Tai O is one of the few remaining places you can still see the traditional houses in Hong Kong. When we arrived we immediately took a 20minute boat ride so we could try and see white/pink Chinese dolphins. The dolphins are a big deal in Hong Kong! They are a treasure of Hong Kong’s natural heritage. Unfortunately, the population is dwindling faster than ever because of the heavy pollution and construction work in the waters they inhabit. It was very special to be able to see a few of the beautiful creatures off the island coast. I have only really seen dolphins at Sea World so it was wonderful to see them in their natural habitat. After the boat ride we walked around the village. At one time Tai O was a very important trading and fishing port. That is a thing of the past because the younger generations have moved out of the village. 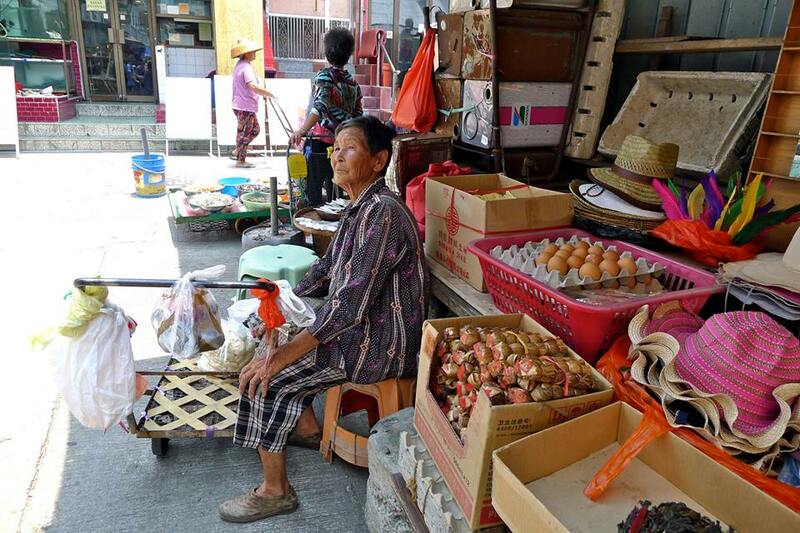 Everywhere I walked I saw elderly people still making a living the traditional way at the lively market. Apparently, the market remains one of the favorite places for locals to buy their fresh and dried seafood and shrimp paste, which is famous. I wasn’t brave enough to try any of the seafood but it sure was interesting to look at! I saw fish balls, squid, abalone, etc. I also saw dried fish including shark jaws! I really appreciated seeing how the people lived in the village especially since I am mostly in an urban environment while I am in Hong Kong. From Tai O we headed over to the Po Lin Monastery and Big Buddha. The monastery used to be a remote place hidden by the lush mountain scenery. It made it to the world map when the Tain Tan Buddha statue (Big Buddha) was built in 1993. 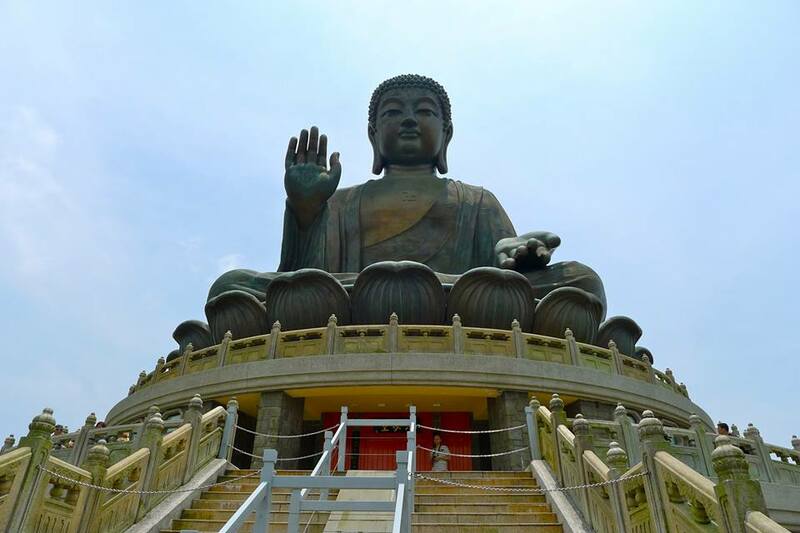 The Buddha is 34 meters high (111.5 feet) and faces north towards Beijing. It took 12 years to complete (It was finished on December 29th, the day of the enlightenment of Gautama Buddha) and cost 60 million HKD. The statue was formed out of 202 separate pieces of bronze. Fortunately the tour bus dropped us off at the top of the Big Buddha so we did not have to walk up the 268 stairs to get to the top. Inside the Buddha is a three-story museum that tells the history of Buddha. There were many beautiful paintings and artifacts to tell the story. There is even a relic of Gautama Buddha, consisting of some of his alleged cremated remains. On the ground floor I saw various small Buddha statues surrounded by notes and flowers. It was explained to us that the area was called the Hall of Remembrance. Inside the Buddha was a gift shop that included many high quality items. I promised my boyfriend, Matt that I would buy him Buddhist prayer bead bracelet so I went to the shop to pick out the perfect one. I found one that was made of a dark wood and had silver inlaid characters on each bead. I asked the cashier what the characters meant and she said they symbolized good fortune. So I bought Matt the bracelet and I also got one with smaller beads for myself. I have grown to appreciate Buddhism because of my boyfriend and I thought it was fitting that I also get a bracelet. The monastery was across from the Big Buddha. I didn’t get to explore it, much which was disappointing. 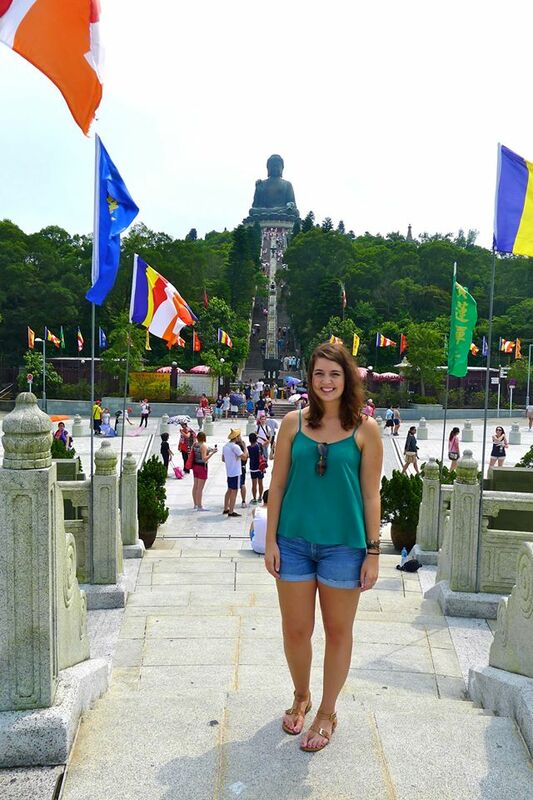 I did however stand in the center of the area that Buddhist monks go to pay their respects to the Big Buddha. Flags from all over the world surround the area. In the center you can hear your voice echo when you speak out loud. It is pretty wild. We couldn’t figure out how it was possible (I am not a super science genius.). Leaving the Po Lin Monastery and Big Buddha was also an experience because we took a 360-degree cable car back down to our bus. 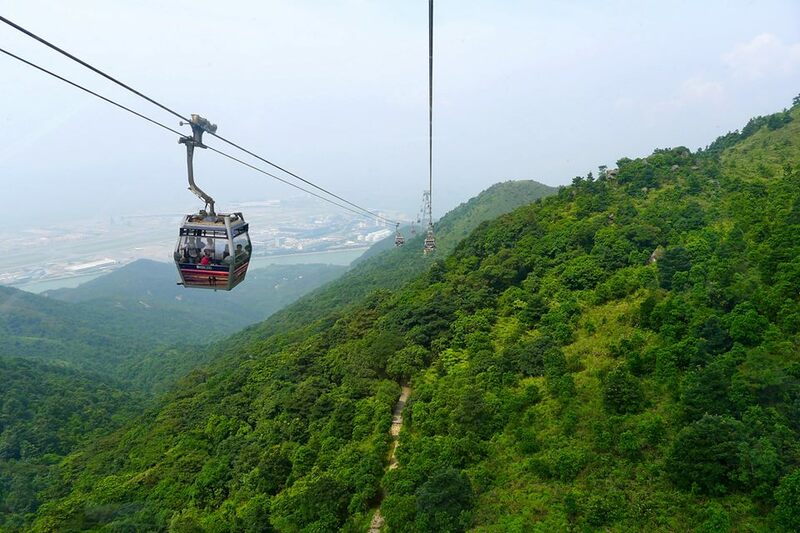 The Ngong Ping Cable Car’s journey took us over beautiful grassland slopes of North Lantau Country Park. In the distance we could see the vast Chia Sea as well as a panorama of the Hong Kong International Airport. It was spectacular to be gliding in the air overlooking Hong Kong. When we arrived back at City University of Hong Kong (where we are staying this summer) a few of my friends and I decided to go see the movie Monsters University in 3D. It was a really cute movie and I recommend it. My day started at 7:00am Sunday because my friends and I wanted to leave for our hike by 8:00am. We had the route mapped out and knew what buses to take to get to our starting point. Before we could get onto the MTR we had to grab breakfast at Taste. I ended up buying a banana and a blueberry muffin to give me some energy. We also bought massive amounts of bottled water because we knew it would be a hot long day of hiking. After taking the MTR and two buses we arrived at our destination around 10am. We immediately noticed a sign at the start of the trail that included a map of the area as well as a description of the trail. 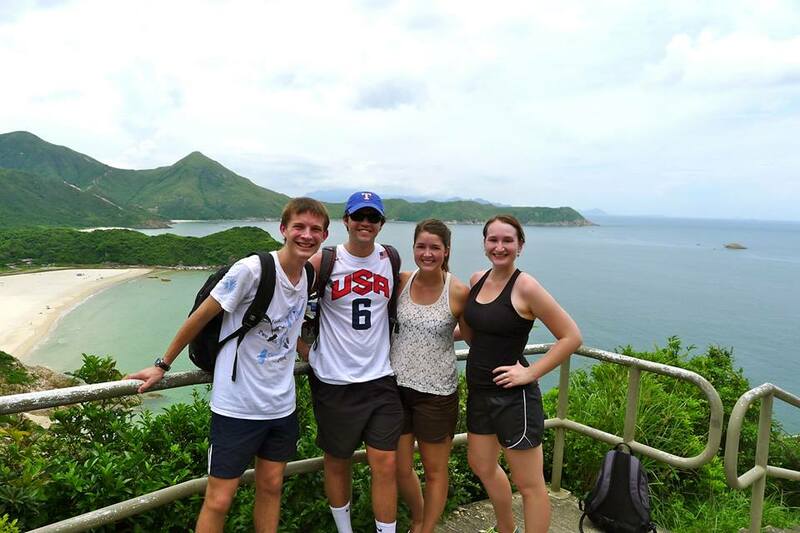 Tai Long Wan Hiking Trail lies in Sai Kung East Country Park. It is suitable for hikers with reasonable experience and who are fit. Along the way there is stunning mountain and seas scenery. The trail starts at Sai Wan Pavilion, along Sai Wan Road, where you can see High Island Reservoir. When you reach the small gap at Chui Tung Au, you meet the sea breeze and have views over the lovely bays of Sai Wan and Tai Long Wan. Down the path, at the bottom you reach Sai Wan village. Rest here and enjoy the beautiful Sai Wan beach. Several families still live in this remote village, but many of the houses are in poor repair. The village still has an old church, built long ago by missionaries. There is also an old lime kiln site at the back of the village, near the beach side. Once villagers used these kilns to produce lime to supplement their fishing income. Beyond the village, go across a stony bridge. The stream that flows under the bridge is the lower course of Kap Man Hang. If you walk upstream you will reach the impressive Sze Dip Tam and Sheung Luk Stream. The seascapes and coastal scenery between Sai Wan and Ham Tin Wan are delightful. When you reach Ham Tin Wan, there is another long beach to explore. West of Ham Tin village, there is a long steep slope from the village up to the gap at Tai Long Au – a good chance for hikers to test their own strength. Walking uphill to Tai Long Au, the rugged Sharp Peak is right ahead of you. Beyond the gap, continue downhill to reach the inshore village of Chek Keng. There are rocky beaches and mangroves by the coast. At low tide, mudskippers and fiddler crabs are seen everywhere. From Chek Keng overhanging trees shades the uphill path. Pass through Long Kill and To Kwa Peng, Wong Shek Pier and Wan Tsai Peninsula are ahead. Walk on for about 20 minutes and you come to Pak Tam Au, on Pak Tam Road. Even though we had read about the hike online my friends and I were even more excited to hike the trail after reading the description. (FYI Tai Long Wan Trail is 12km (7.4miles) long! And I hiked the whole thing!) Our hike started off great! We were all surprised that the trail was paved with cement and bricks, which made it easier to hike. When we came across the first village we stopped to take photos of the beach and also to grab a bite to eat. I drank mango juice and ate pineapple vegetable rice. My lunch was supposed to have chicken in it. It wasn’t until after I had eaten some of my food that I realized I had Lauren’s dish which was exactly the same minus the chicken. It wasn’t a big deal though because it still filled my stomach and tasted good. After lunch we continued our hike. We stopped many times to take in all the beautiful scenery and take photos. We also encountered many large spiders relaxing in their spider webs waiting for their next meal to get caught in their web. 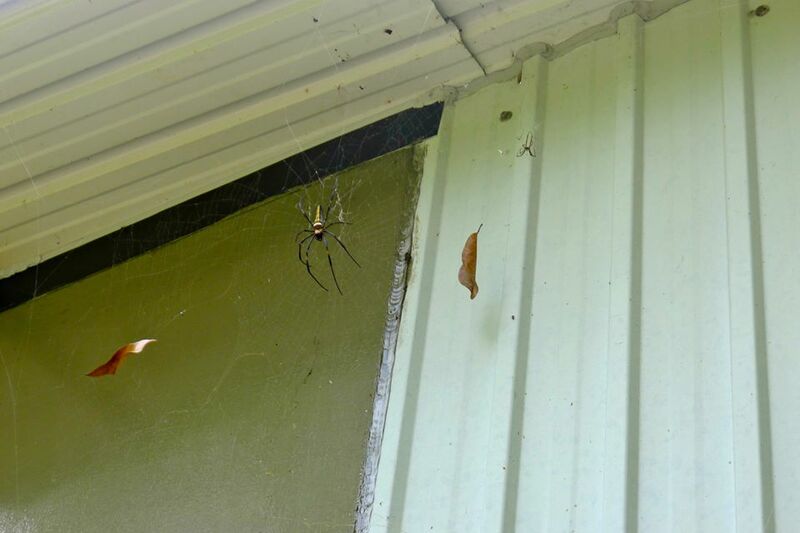 I was taking a photo of one of the spiders when my friend Andrew decided to say, “Be careful it is going to jump!” Before I even gave it a second thought I quickly lurched backwards scared out of my mind that it really was going to jump on me. I turned to look at Andrew and saw him laughing and realized he was just being a mean to me (Well he was teasing me). The second beach we arrived at on our hike was even more breathtaking than the first. As we came over the top of a mountain I could see the beach below us. The sand was white and pristine. The ocean was a beautiful blue that darkened in color as it stretched into the distance. I had never seen anything like it before. As we hiked down the mountain towards the beach we saw boats and yachts anchored off the beach’s shoreline. People were in the water swimming and throwing a football around. We walked on the hot sand towards the water but did not put our feet in because we hadn’t decided to stay and relax. 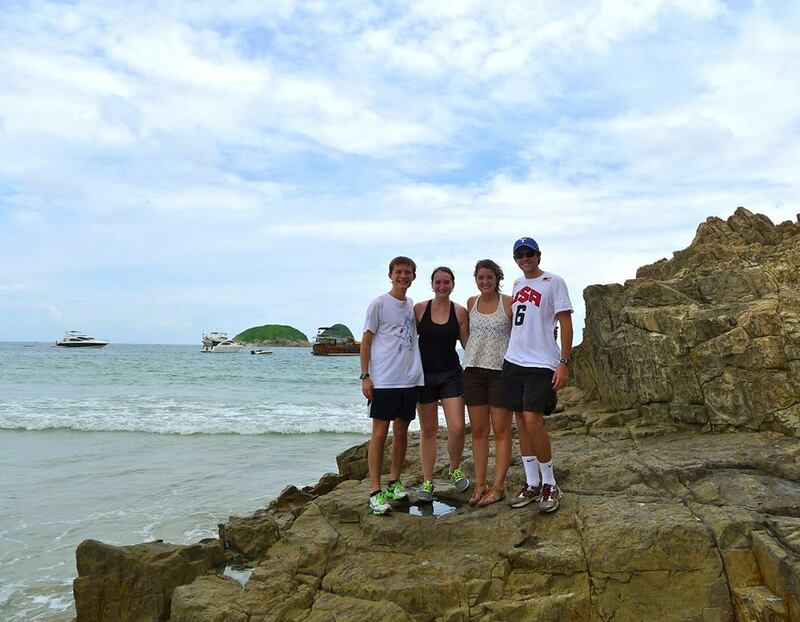 We took a nice group shot on the beach and then we continued on our way. We followed a trail behind the beach that wasn’t paved. It was very apparent that it was in fact a trail so we didn’t question our direction at all. Along the way we noticed large piles of manure. Within a few minutes of spotting the piles we ran into small heard of cattle grazing in an open field. My friends were pretty amused by this because they had never seen cattle so up close before. As we continued to follow the trail we came across another village that was on a beach. We got really excited because we saw the cool bridge we had seen online in photographs. Essentially the bridge is made out of wood nailed and tied together with rope. It was not the sturdiest thing to walk on but it made for some good photos. As we crossed the bridge we realized that the beach we were on was the same one we were just at! We walked all the way behind the beach through fields filled with cattle and manure when we could have just walked to the other end of the beach! After we got over our shock we decided to sit down and eat an ice cream bar and rehydrate a bit with Gatorade. We discussed whether we should stay at the beach for a while and go swimming but after looking at a map we saw there was one more area of water up ahead. So we figured it was another beach and decided to wait till then to lay out and go swimming. We didn’t want to be hiking in wet swimsuits/clothes. As soon as we were finished eating our ice cream and looking over the map we were back on the trail! As we hiked up a huge mountain I had to stop multiple times to catch my breath and drink some water. (Lauren usually stopped with me.) On the other hand the guys, Landon and Andrew, didn’t need to stop as often. I mean they are definitely in better shape than I am. Still I was able to keep up during the whole hike, which I am really proud of. Once we reached the top of the mountain after the second beach we came across a couple. We asked them how much farther it was until the next beach. The man looked at us funny and said, “There is no beach.” Immediately Lauren and I gave Landon and Andrew glares because they convinced us that there was a third beach along the trail. So they were wrong. We were all a bit disappointed that there wasn’t another beach but as we came upon the third area of water we changed our tune. The third area of water was a very peaceful place. 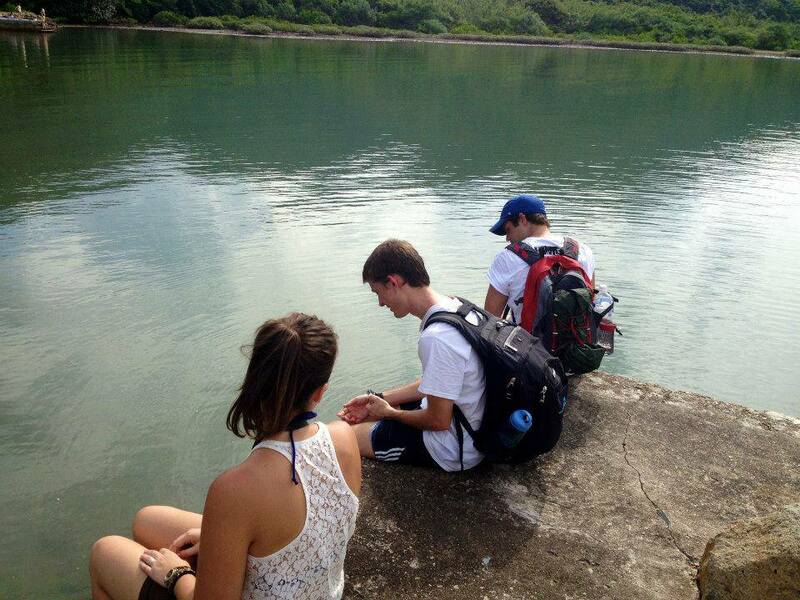 For the most part the whole hike was peaceful but nothing compared to the water at the end. The water area was a part of the ocean but it was a secluded bay/channel so the water was still. The water reflected the lush green mountains all around us. Along the water there was a pier that the four of us decided to walk out on. We asked some fellow hikers to take our photo and then we sat on the pier for a while just listening to the water all around us. It was in those moments that I reflected on how far I have come. I thought of the past couple of weeks in Hong Kong and how much I have learned and grown. In those moments I was truly happy with my life and what I have accomplished so far. As we left our “concrete beach” (our nicknamed for it), we came across an abandoned village. It is possible that some people live in the area but it didn’t seem like it. Abandoned buildings are one of my favorite subjects to photograph so I really enjoyed exploring the village a bit. After leaving the village we followed the trail until we reached the main road. We waited a few minutes for a double decker bus back to the city and as soon as we got on board it we all took naps. The hike wore us out! 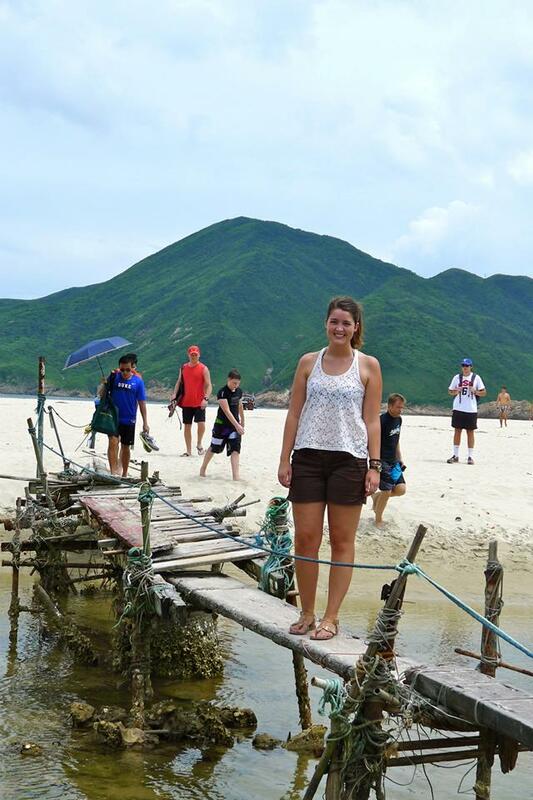 Overall, hiking Tai Long Wan Trail was amazing! It is difficult for me to put into words all the amazing parts of the hike. I still can’t get over that I did it! I keep looking at my Facebook album of the hike to remind myself that I really did go on the hike. The beauty I saw on the hike is really there. So when I yearn to be in nature and I am stuck in a concrete jungle (like Hong Kong or Chicago) I can just look at my photographs and see the lush green mountains and the beautiful blue ocean. ← I am an intern. I do work.